Anxiety and insomnia have troubled many generations. People try all sorts of things to help ease it—meditation, yoga to relying on medicine. Would you believe me if I said your anxiety and insomnia will go away just by sleeping? Probably not, because though enough sleep has tremendous benefits, it is not truly healing and that easy to get. Not getting enough sleep leads to irritability and change in a person’s demeanour. Prolonged amount of disturbed sleep also leads to a significant drop in immunity and makes a person less productive. There are many sleeping devices on the market designed to help us get good sleep, but one of the less talked about ones is the idea of a weighted blanket. Weighted blankets are becoming more and more popular with many people finding that they help improve sleep. Weighted blankets have been traditionally used for relaxing kids with autism. These are regular blankets filled with plastic poly pellets that equally distribute the “weight” of the blanket. This extra weight creates a pressure that envelops the body, similar to the sensation of a hug. Adults describe the sensation of sleeping with one as that of being swaddled as a child. The pressure of the blanket provides proprioceptive input to the brain, which in turn relaxes it and promotes sleep. Why is a Weighted Blanket Effective? Elongated physical touch has proven to suppress fear and anxiety for a long time. Perhaps this is why a mother’s lap is an endearing place to be in. A hug lasting longer than twenty seconds is proven to build a stronger person between the people who hug. Weighted blankets use this similar phenomenon of physical touch to de-stress a person. Without using invasive methods, the weighted blankets uses pressure from outside to relax the nervous system of an anxious person. Psychiatric, trauma, geriatric, and pediatric hospital centres also use this technique to keep patients at ease without having to make their bodies dependent on medicine. The use of weighted blankets ensures the lessening of anxiety and a long rested sleep. Weighted blanket uses the technicalities of a type of therapy called Deep Pressure Touch Stimulation. This therapy shows that physical touches like that of a hug or back rub or massage can be deeply relaxing. The weighted blankets copy this physical sensation through their poly pellets ensuring relaxation. Pressure has proven to be a way to relax the body and mind. It secretes an enzyme called serotonin. Serotonin is mostly known for constricting the muscles and being a transmitter of neural signals. However, scientists have also said that it has a role to play in balancing one’s mood. So when one sleeps or cuddles with the weighted blanket, the pressure produces serotonin that relaxes the muscles and calms your mood. Thus, it helps in relaxing both the body and mind. This shows that this one blanket can help all. Patients of all kinds of mental illnesses can use these to their advantage. 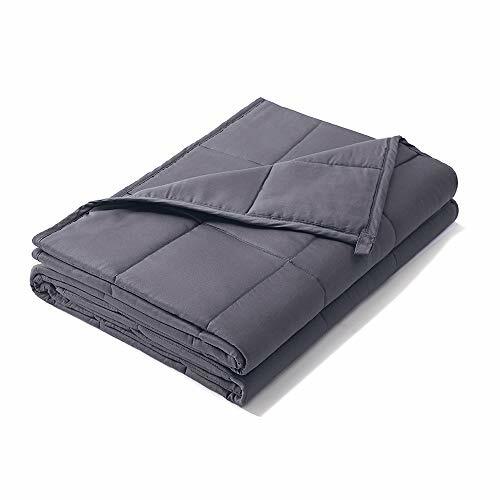 Thus, the versatile use of a weighted blanket comes in handy especially while treating a person known to be frequently disturbed or stressed on a mental level. The best part is how weighted blankets are personalized to fit one’s need. Weight: They come in different sizes and weight to suit the need to any age. An adult is recommended to take anything between fifteen to twenty pounds. An ideal ratio is having the blanket be 10% of the person’s body weight. So if your ideal body weight is 20 lbs., your blanket should be between two to four lbs. Anything less than two would prove to be ineffective, as it does not give enough pressure. On the other hand, anything more than five lbs. can harm the body over a long period of extensive pressure on one’s bone structure. However, it’s advised to consult a doctor before purchasing one, as they will consider more than the simple weight ratio, especially if this is for a child. Removable cover: Most blankets come as a two-piece set; the weighted blanket and a removable cover. It is useful to have a removable cover as you can keep the weighted blanket clean and wash the outer cover whenever it needs a clean. 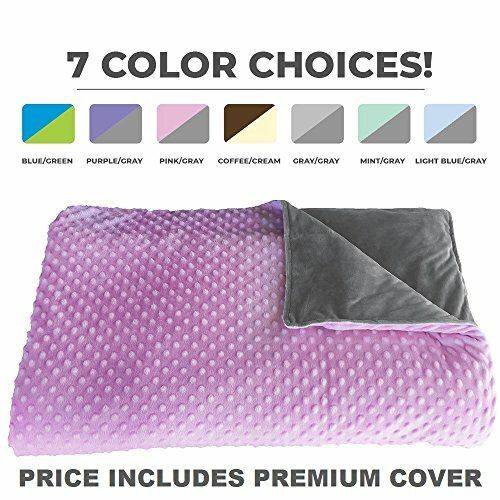 If you do buy a weighted blanket without a removable cover, you can buy covers separately. Guarantee: If you are going to buy a weighted blanket it’s advisable to buy one that comes with a satisfaction guarantee. Finding the right weight, size and comfort level isn’t always achieved on your first purchase. Having the option to return your weighted blanket is advisable just in case. Obviously the longer the guarantee the better. Weighted blankets are not advisable for people who have recently been in surgery or have a withstanding illness of claustrophobia or weak bones and muscles. Now that we’ve covered what are some of the important things to consider when buying a weighted blanket, it’s time to look at some of the best blankets available. Some users report that they have received different sizes to what they ordered, often receiving smaller sizes than expected. This weighted blanket by Weighted Ideas comes in weights from 10lbs all the way up to 30 lbs and also in a variety of colours to choose from. Out of all the blankets, this one seems to have the most weights and colours to choose from. It is made from 100% premium cotton meaning it is incredibly soft to touch as well as breathable. It is one of the lower priced weighted blankets on the market, however, it does not come with a duvet cover like some of the other brands. Restorology have produced a weighted blanket which ticks all the important boxes. It is well made, comfortable and effective. 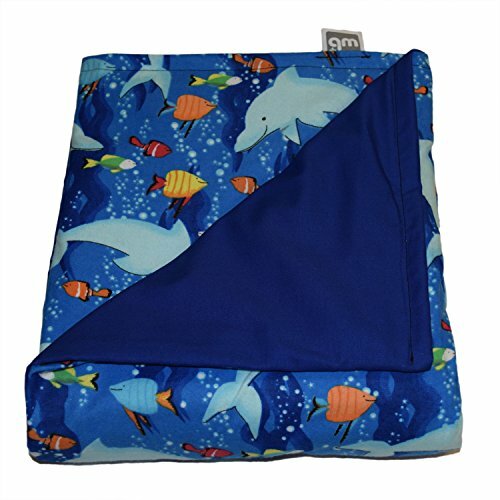 This blanket comes in weights that are suitable for adults and kids ranging from 8lbs up to 20lbs. 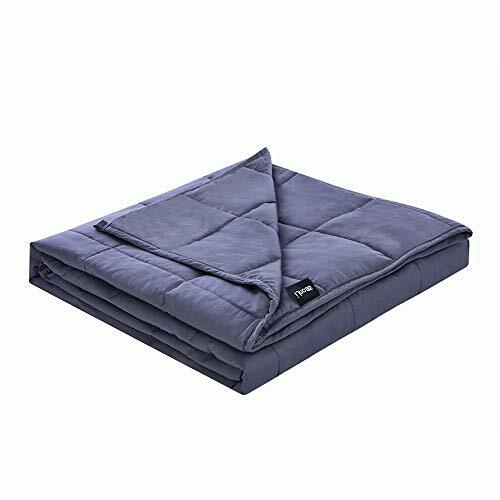 However, If you are looking for a heavier blanket of 20lbs or above, you’ll have to consider another option such as the Weighted Idea blanket (above) which goes all the way up to 30lbs. The Restorology blanket is slightly higher in price than most other blankets, however, it barely has any negatives to it. Furthermore, it’s removable and washable cover will appeal to many. Comes in incremental weights of 15, 20 and 25lbs only. Deep Sleep by Miran is one of the highest quality weighted blankets available. It is very well made and is effective at delivering all the benefits a weighted blanket is supposed to bring. 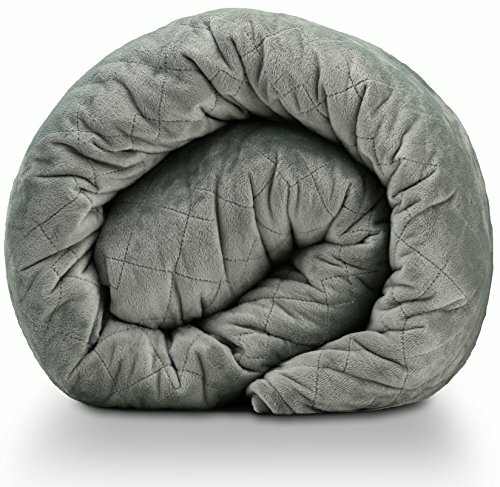 Like the Restorology weighted blanket, it has a removable and washable cover and is very soft. If you’re thinking about buying the Deep Sleep there is only one size and one colour to choose from. The only choice you have to make is choosing from one of three weight options (15, 20 & 25 lbs). Zonli’s weighted blanket is one of the best-selling blankets on Amazon. It’s fairly low priced compared to some other weighted blankets, however, it does not come with a luxury duvet cover like most other brands. In some ways this is an advantage as you can buy weighted blanket covers on Amazon where you would be able to choose your own colour and fabric. However, if you want a cover with the blanket you would be better off with some of the other options on this list. Harkia’s weighted blankets come in small increments ranging from 5, 7, 10 lbs all the way up to 25 lbs. The lighter ranges are suitable for kids and come in three attractive colours. The blanket also is great for children with sensory processing order as there are added dots on top of the soft fabric. People who want a weight of over 12lbs will have to buy another blanket. Someone who gets easily overwhelmed by making choices will find this blanket an easy purchase, over other brands as the only choice you have to make is which colour you want. The manufacturers Platinum Health only make one blanket which is 12lbs and 60″ x 80″ in size because these are the dimensions and weight that they claim studies show is most optimal. It is designed so that you can get varying weights depending on how you use the blanket. For example to get 6lbs you use half the blanket, and if you want 9lbs you would use three-quarters of the blanket. Some people may be attracted to the versatility of the blanket, and may even purchase this with the idea of being a child’s first blanket in which she uses more of the blanket as she needs a greater weight. This blanket is perfect for kids and comes with many weight options as low as 4lbs for children all the way up to 20lbs for adults. The available designs and patterns are what makes this weighted blanket stand out most. Whilst this blanket is slightly more expensive than some of the others, the quality and effectiveness makes the price justified. If you struggle with sleeping at night, or know someone who does, a weighted blanket could well be worth trying out. A lot of people have been sceptical to try them out, however once they do, they find themselves getting the best nights sleep they’ve ever had. Furthermore, people who suffer from anxiety and other disorders have found great relief from these blankets. A weighted blanket can be highly beneficial and helpful to people of all ages. Not only is this an easy way to keep your insomnia and anxiety in check, it saves a lot of money while doing so.